LONDON, England (CNN) -- The super-yachts of the super-rich could soon become super-green. The solar sail: super-yachts could cut fuel consumption and emissions by using a sail similar to this. Sydney-based technology company Solar Sailor is working on a "solar sail" which could act as both a sail and a solar power source to all sorts of large vessels. Super-yachts owned by billionaires like Chelsea Football Club owner Roman Abramovich and Microsoft co-founder Paul Allen are currently among the biggest fuel guzzlers on the planet. Some of the ocean-going beasts like Sheikh Mohammed bin Rashid Al Maktoum's "Dubai," the biggest private super-yacht in the world, are over 150 meters long and contain amenities like aircraft hangars, movie theaters, Jacuzzis, and swimming pools. All of these features sap incredible amounts of energy. Fuel consumption estimates on super-yachts have ranged up to one liter of fuel per second when traveling at high power. Solar Sailor's CEO Robert Dane told CNN the technology could work perfectly with super-yachts. He said the solar sails had the ability to significantly reduce the boats' fuel consumption and greenhouse-gas emissions. "We think it would enable people to have their super-yacht but make little or no carbon footprint, which is the big problem with these vessels," he said. Dane said the technology worked by using a wing that is a solar panel or a sail, pivotally mounted to a vessel so it can be angled to the sun or the wind. The "sails" are controlled by a computer which takes into account the direction and strength of sun and wind to optimize energy collection. Could Roman lose his boat? A design project is currently underway in the United Kingdom to create a solar sail for the super-yachts, he said. Dane said the company was working with Chinese shipping company COSCO to get solar sails on some of its fleet. "Our aim is for a trail of retrofitted sails to one bulker and one tanker in 2010. Based on the results of this, then we would design 'new-build' vessels," he said. 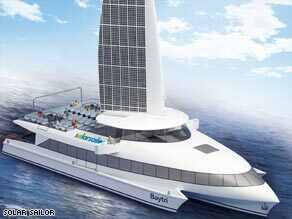 Dane estimated the sail could save about 5 percent in fuel consumption from the solar power and another 20 to 40 percent from wind power when the vessel is traveling at 18 knots. "This might add up to a 10 percent saving overall in the whole journey," Dane said. He said there were further hopes that the technology could be improved by developing systems to raise and lower sails with fewer moving parts and store energy more efficiently.